In Tagore’s ‘Kabuliwala’, an Afghan moneylender longs for his ‘watan’ even as he develops affection for a little girl, Mini, in Kolkata. The character of Rehmat, later immortalized by Balraj Sahni on screen, became synonymous with the Kabuliwalas who arrived in the city sometime in the late 19th century, bringing with them spices and dry fruits from Afghanistan. More than 500 Afghans call Kolkata home. They refuse to be called refugees. In the Tilak Nagar gurdwara, also known as the “Kabuli gurdwara,” the refugees exchange sad tales of separated families, bureaucratic glitches and long waits for India citizenship almost every day. “If I had money I could easily become an Indian citizen. It is my misfortune that I have nowhere to go,” says an old Sikh. Since 1981, thousands of Hindus and Sikhs have come to India from Afghanistan but only 650 of them have become naturalized Indian citizens. Others are waiting for Indian citizenship. According to Nayana Bose, Associate External Relations Officer of UNHCR, more than 90% Afghan refugees are Sikhs or Hindus. She points out how for any foreigner interested in Indian citizenship, 12 years of residency in the country is a must. This applies to refugees as well. Consequently, the resettlement process for many has become a long and tiresome process. The ethnic Afghans too have been struggling for a better life. A group of 38 men and 48 women, all ethnic Afghans, who have been provided employment by Don Bosco Ashalayam with the help of UNHCR, Delhi does not knpw what the future holds for them. Homaira Frotan (name changed on request) left Kabul for Delhi in 2006 as she was worried about her children’s future. “There were many cases of kidnapping. We are Christians. We had hidden for long in Kabul but it was no more possible. We cannot continue to live in India either. It is so expensive. We have now applied for citizenship in Canada and Australia,” says Frotan. The situation of all Afghans in India remains precarious because India is not a signatory to the 1951 UN Convention, relating to the status of refugees, or the 1967 Protocol. A number of Afghans in India who are officially not recognized by UNHCR as either “asylum seekers”or post a successful interview, as “refugees,” are forced to eke out a difficult unaided existence. Money is a big problem. Salar Nader (name changed on request), who came to Delhi with his wife Asiya (name changed on request) in 2009, got his “blue cards” within eight months of their arrival and their kids started going to school, but the couple is unable to cope with life in the capital. “I have to pay Rs 11,000 for one room. I earn only Rs 20 per hour. I have two kids. How will I manage?” asks a helpless Asiya. Nader, who has 10 years of experience in journalism and was a mixer in the 2003 documentary “Osama”has to clean beds and toilets in Afghan guest houses to earn a living. He cannot go back to Kabul, because the Taliban threatened to kill him. For a country that is trying to make its presence felt in Afghanistan, India has done precious little. “A national legal framework for refugees would benefit both refugees and India,” says Bose. UNHCR, which was set up in India in 1981 has gone a long way in reaching out to refugees. However, operating in a country, which has no legislation for refugees, has curtailed its impact to better the lives of Afghanis who need help but cannot seek it openly. 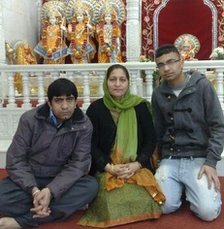 Members of Leicester’s Hindu community are supporting an Afghan family’s battle to stay in this country. Arti Kumar and her two sons, Akash and Ravi, fled the war-ravaged country in September, 2007 after being targeted by the Taliban. The Hindu family claimed asylum in Britain but have now been told they face being deported back to Afghanistan. A meeting is being held in Leicester tonight to raise awareness of the family’s plight. Mukesh Naker, spokesman for the Leicester-based British Hindu Voice, said: “We are very surprised at how the Government has treated this family because all religions – Sikh, Hindu and Christian – face persecution in Afghanistan. The Kumars say their lives in Afghanistan were torn apart when 16-year-old daughter Rekha was abducted by Islamic extremists and her kidnappers brutally assaulted eldest son Ravi, who was left with brain damage and behavioural difficulties. Arti, 42, had to leave her husband Ram behind. She has not heard from him since. Arti, Akash, 18, and Ravi, 21, who are living in Middlesbrough, had their asylum status withdrawn following a review by the authorities. The British Hindu Voice’s meeting takes place at the Shree Wanza Community Hall, Pasture Lane, Leicester, tonight at 7.30pm. It will be attended by the Baroness Sandip Verma, of Leicester. A Hindu family facing deportation to Afghanistan say they fear religious persecution by the Taliban if they are forced to return. Arti Kumar says she fled the country in September 2007 with her two sons, Akash and Ravi, because they had been targeted by the Taliban. Ms Kumar claimed asylum upon arrival in the UK and was moved to Middlesbrough. She has now been told by the UK Border Agency that they do not have the right to remain here and must go back. The family say they decided to leave after a Taliban guard attacked older son Ravi, then aged 17, hitting him on the head with a rifle. The assault left him brain damaged. They sold the family textile business to raise money to pay an agent to take them out of Afghanistan. But they were told he could only take three of them. She also believes her 16-year-old daughter Rekha was abducted by the Taliban. She has never been found. They believe that their lives will be in danger if they are forced to return. The family received a letter from the UK Border Agency last month which said that their asylum status had been removed and that they should leave their accommodation as they were no longer entitled to any benefits. They are being supported by the Hindu Cultural Society in North Ormesby in Middlesbrough. The president, Krishan Kumar Nath says he cannot understand the UKBA’s decision to deport them. Mr Nath has now instructed new lawyers on behalf of the family, and has made another application for asylum. The Hindu Cultural Society has also started a petition for the family.